Horsham Spinners have served up a superb success netting victory in the Junior British League with a dominant performance over two weekends. Unlike the majority of teams in the JBL, the team is comprised solely of home-grown players coached at Horsham Spinners Table Tennis Club, now based at Slinfold Primary School. The players of Will Michell, Charlie Graham-Adams and Owen Brown all achieved success in Division 4A. Michell was the number one based on junior ranking points for both weekends and the other two were number two for one weekend and number three for the other, due to a change in the rankings in between. Four of the teams were no match for the Spinners, as in the first weekend they whitewashed them all 6-0 and in the second weekend they won two matches 6-0 - against Byng Hall and Brighton City - and two matches 5-1 -against Rotherham Scorpions and Ellenborough. 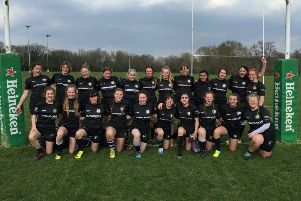 The only team on a level playing field was the Ulster team, with whom they drew on the first weekend, but Spinners ended the first weekend with a superior game difference of five ahead. The final match of the second weekend paired the two top teams for a decisive encounter. Spinners needed a draw from this last match in order to win the division, despite the fact that Ulster had drawn with third placed Byng Hall. The match started with an unfortunate fifth game loss for Michell to Ulster number two Julian Kelly. However, next up Brown had a heroic win 3-1 vs Ulster number one James Magrath, who had won 10 out of 10 in the first weekend. Graham-Adams then had a close 3-0 win over the number three Matthew Cherry. Michell then lost in four to Magrath and Graham-Adams lost in four to Kelly to go 3-2 down. The pressure was all on Brown’s shoulders in the final singles match against Cherry, as it was a must-win game. The Spinners player thrived under the pressure and delivered a confident straight games victory to secure the draw and the title. The players all played 20 matches each and impressively Graham-Adams won 18 out of 20 and both Michell and Brown won 17 of their 20 matches, and were all at the top of the averages.. Anyone interested in taking up the sport should contact club coach, Rory Scott on rorytabletennis@aol.co.uk. Their coaching sessions are on Mondays 5.15pm to 7.15pm, Wednesdays 7pm to 9pm, Fridays 5pm to 7pm and Fridays 7pm to 9pm (elite session-invitation only) at Slinfold Primary School.